“The Dam Keeper” from Bay Area-based Tonko House LLC is one of eight nominees for best animated short subject in the 42nd Annie Awards, which will be presented Jan. 31 at UCLA’s Royce Hall. Directed by feature animators Robert Kondo and Daisuke “Dice” Tsutsumi, “The Dam Keeper” is a first-time collaboration among some of the most talented artists in the field. It made its world premiere as an official selection at the 2014 Berlin International Film Festival and made its U.S. premiere at the New York International Children’s Film Festival. “The Dam Keeper” is on the shortlist for an Academy Award nomination and has been screened at film festivals in the U.S., Japan, Canada, England, Scotland, Ireland, Denmark, Italy, Germany, France, Portugal, Russia, Slovakia, South Korea, Brazil, Mexico and Costa Rica. It has won 25 awards, including Best Animated Film at the San Diego Film Festival, Best Animated Short Film at the Long Beach Indie Film Festival, and Jury Award for Golden Gate Family Film at the San Francisco International Film Festival. Set in a desolate future, one small town’s survival is solely due to a large windmill dam that acts as a fan to keep out poisonous clouds. Despite bullying from classmates and an indifferent public, the dam’s operator, Pig, works tirelessly to keep the sails spinning in order to protect the town. When a new student, Fox, joins Pig’s class, everything begins to change. Made up of over 8,000 paintings, “The Dam Keeper” blends traditional hand-drawn animation with lush brushstrokes to bring Kondo and Tsutsumi’s celebrated painting style to life like never before. Danish actor Lars Mikkelsen of television’s “Forbrydelsen” (The Killing) and “Sherlock” narrates this timeless fable. Tsutsumi, originally from Japan, is a celebrated illustrator, painter and philanthropist. His paintings have been exhibited around the world, and in 2009, his first children’s book, “I Can Hear,” was published in Japan. A graduate from the School of Visual Arts in New York, he has worked as a visual development/color key artist at Blue Sky Studios on “Ice Age,” “Robots” and “Horton Hears a Who!” His credits at Pixar include lighting art director for “Toy Story 3” and “Monsters University.” He is passionate about charity work and spearheaded both The Totoro Forest Project and Sketchtravel. For more information, visit www.TheDamKeeper.com. The other Annie Award short subject nominees are “Coda” (And Maps And Plans Ltd.), “Duet” (Glen Keane Productions/ATAP), “Feast” (Walt Disney Animation Studios), “The Simpsons — Michal Socha Couch Gag” (Gracie Films in association with 20th Century Fox TV), “Me and My Moulton” (Mikrofilm AS/National Film Board of Canada), “Silent” (Moonbot Studios), and “The Raven” (Moonbot Studios). 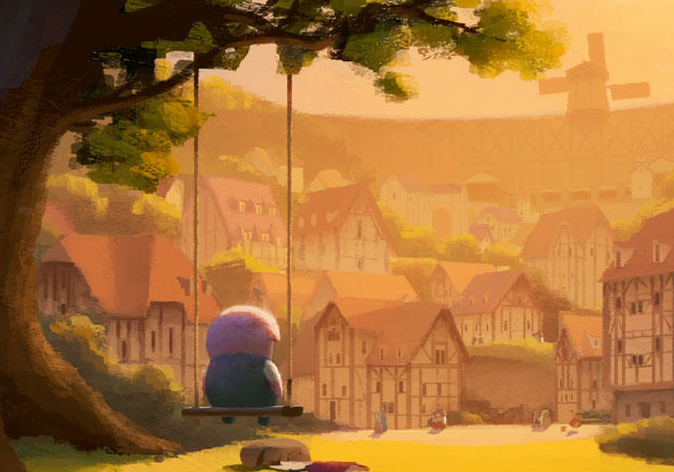 “The Dam Keeper” will be among shorts for ages 8-14 to be shown as part of the 10th annual Los Angeles International Children’s Film Festival on Sunday, Dec. 14, at 11:45 a.m. at the L.A. County Museum of Modern Art’s Bing Theater, 5905 Wilshire Blvd., Los Angeles. Free and open to the public. Seating is first-come, first-served. 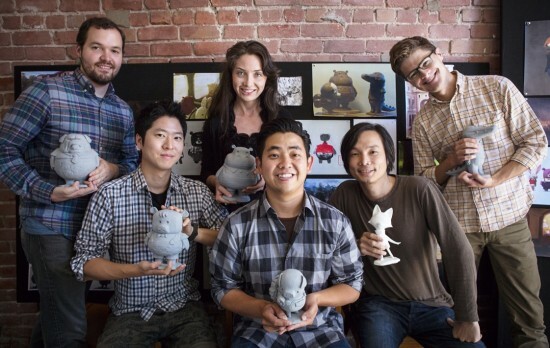 Pictured with models of characters from “The Dam Keeper” are (from left) editor Bradley Furnish, supervising animator Erick Oh, producer Megan Bartel, director Robert Kondo, director Dice Tsutsumi, and producer Duncan Ramsay.